Holy schmidt, I found my old recipe book. Does everyone have something like this at one point or another? A notebook or composition book with recipes torn from magazines and newspapers, some pasted or taped in, some loose? This was mine. I'm looking through the pages as if looking through an old yearbook. *Gasp* The nectarine-kiwi tart! I never made this but I had aspirations to. I mean look at it, is that not divine? 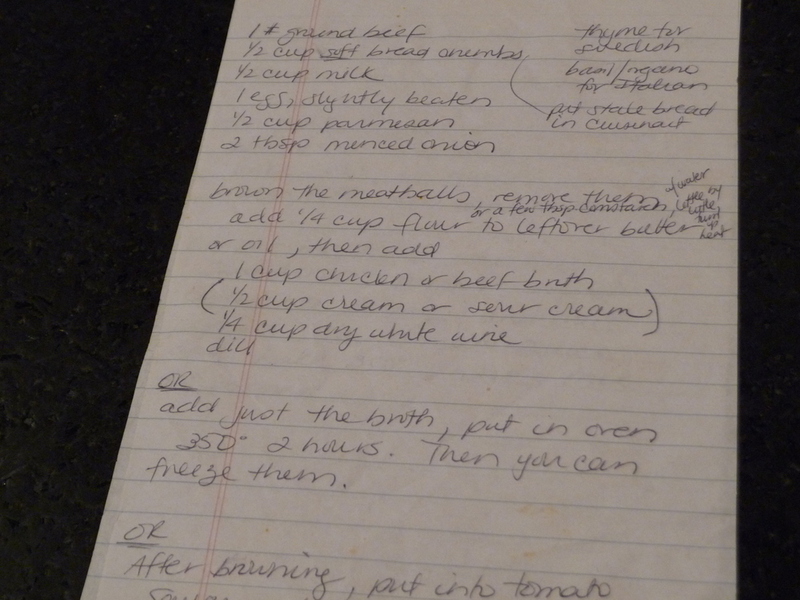 This, my friends, is what I wrote down one day in the spring of 2001, when my mother came over to my house in Croton Falls to teach me how to make meatballs. Not because of anything bad between us. We were just on shaky ground. Two years prior, we had closed the dance school my mother had run for over 30 years, the school where I had grown up, and where I had taught with her for 9 years. We lived, ate, drank and breathed the school. I'm sure it wasn't all we talked about, but it seemed like it was all we talked about. Now, suddenly, our common thread was tied off and clipped. Suddenly there were awkward silences between us. I felt like I had to get to know my mother all over again, and she me. I was also in the grip of serious post-partum depression. I was twelve pounds underweight, fighting terrible anxiety attacks, trying to deal with going back to work, trying to figure out motherhood as well as daughterhood. My mother came over to cook. I know she was upset and scared for me, but she was so gentle. She didn't offer advice, she didn't try to fix it. She just came over to cook. We made meatballs in gravy. I think we may have even made spanikopita that day, too, but I mostly remember making meatballs. I remember asking her, for the first time, "Did you want to have a lot of children?" (There is just my brother and me, but I wondered what her vision of a family had been when she was young). I remember her drinking a cup of coffee and furrowing her brow before she responded, as if this was the first time anybody had asked her. We talked about children. We talked about mothers. We talked about food. Together, stumbling, we began the steps of a new dance. It was the day my mother began to become my friend. I make meatballs by rote and instinct now. I don't need these pieces of paper anymore. But I'm going to keep them forever because they are more, so much more than a recipe.